465 pages | 59 B/W Illus. 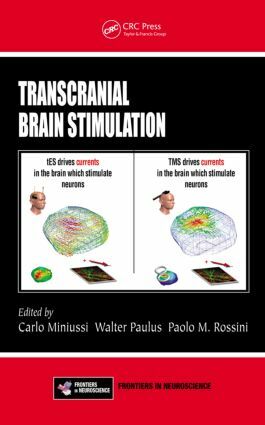 Since the discovery of transcranial magnetic stimulation (TMS) and transcranial electrical stimulation (tES), these non-invasive brain stimulation (NIBS) techniques have been used to investigate the state of cortical excitability, and the excitability of the cortico-cortical and corticospinal pathways. In addition, these techniques have been found to induce neuroplasticity—a significant breakthrough in our understanding of the brain at work. Transcranial Brain Stimulation presents a wide range of possible brain stimulation applications and discusses what new information can be gained from using this technique on the dynamics of brain functions, hierarchical organization, and effective connectivity. Implications of recent findings related to the therapeutic application are discussed by an international group of leading experts, who present practical guidance on the use of each technique, and catalog the results of numerous TMS and tES studies on biological and behavioral effects. Carlo Miniussi is an Associate Professor of Human Physiology at the Department of Biomedical Sciences and Biotechnologies, School of Medicine, University of Brescia, Italy. Walter Paulus is a Professor of Clinical Neurophysiology and Head of the Department of Clinical Neurophysiology at Georg-August University in Gottingen, Germany. Paolo M. Rossini is a Professor of Clinical Neurology at the University of Campus Biomedico in Rome, Italy.